Why would an international group of accounting firms want to be in Second Life? Answer: Student recruitment, appeal to young professionals, host meetings, offer training & CPE, and networking. Sounds a lot like real life doesn't it? That's is what IGAF Worldwide CFO, Anne Hampson told me recently as we discussed where they wanted to build their new offices on CPA Island. I couldn't agree more and applaud their vision. With over 200 colleges & universities in the virtual world, we have been saying that the CPA Profession needs to be here to be relevant to the "gaming generation". I am almost positive that this makes them the first CPA firm association to take this big step. Their offices are very impressive (picture above) and I recently ran into Anne and some IGAF team members as they came in-world to attend heir first "virtual staff meeting". Look for Anne Hampson (SL - Anne Wellesley) and IGAF CEO, Kevin Mead (SL - KevinMead Fairport), on stage as we feature them at our session titled, CPAs & Second LIfe on Monday, June 15th at 1:00 pm (PT/SLT) as part of the AICPA Tech Plus Conference - in Las Vegas. We will also be offering a live event from Baltimore and on virtually on CPA Island (that is where these virtual worlds really make a difference). We will actually be reaching audiences in all three venues at the same time! So, welcome IGAF Worldwide and we look forward to working with you! When you visit CPA Island, don't forget to check out the virtual headquarters of the Shapiro Negotitaions Institute (jus tacross the bridge from the welcome center lighthouse). The focus of SNI is on maximizing their clients’ ability to create mutually beneficial and profitable long-term relationships with peers, vendors, and customers – both internal and external to the organization. SNI co-founder and president, Mark Jankowski appears in-world as Mark Wizenheim and has dived into the exciting medium of Second Life to bring interactive education on CPA island. Mark has really worked to use all of the features of teh 3-D immersive environment to enhance negotiation trianing. I have been in a couple os sessions and love it. Look for their upcoming course on June 17th on CPA Island - check their website for details. Stay tuned for future CPE sessions with Mark by checking our CPA Island blog also. We are proud to have them as our newest tenant (and partner)! Over the last month I have been reading about the death of Second Life as the news organization Reuters closed down their in-world offices and several big name brands exited the virtual world. But just like in real life, the recovery (in real life and second life) will most likely come not from the big corporations but form the nimble, entrepreneurial small and mid-size business sector. They will see the benefits of virtual worlds, not for just broadcast advertising and brand placement but for "real" uses like collaboration, training, recruiting and all the while saving money. "SME's, universities, colleges, training groups and health-care providers are all deriving benefits from their usage of the virtual environment and few of these successful models rely on drawing the interest of Second Life users at large or drawing large quantities of eyeballs. The number of educational institutions operating in Second Life is literally countless. It's a mammoth task just trying to total them all up -- and by the time you're done there seem to be more of them than when you started." Second Life can be used as an environment to be utilized for interaction, collaboration and training of your staff. This use doubles as a bit of advertising for your company that might prove palatable to the general public. Using Second Life as an advertising-only vehicle is relatively pointless unless you are willing to experiment somewhat rigorously and learn from your mistakes. "Another case in point is the CPA Island (http://www.cpaisland.com/) build. The MACPA (Maryland Certified Practicing Accountants) run conferences here on a regular basis; CPAs can attend these conferences in Second Life to earn CPE credit (this is a points system for the ongoing education of CPAs). The MACPA have engaged speakers from across the globe to lecture on a wide variety of topics; they started in the middle of this year, and the conferences have been so successful that they plan to continue into the foreseeable future. It has also raised the profile of CPAs within the consciousness of Second Life users." "So I went to the ampitheatre on CPA Island in Second Life and saw a number of other avatars present. Many were CPAs with no affiliation in Second Life except for the CPA professional development - it was exceptional. There was an animated talk on Enterprise Risk Management discussing myriad aspects of planning the prioritization of strategies with adherence to risk management principles. The talk was great, but the medium was fantastic." And Edith Orenstein, social media maven at the Financial Executives International (FEI) and her first experience with the virtual world in her post, Get a (Second) Life. We have hosted a couple of mixed reality (virtual & real) meetings with the San Francisco FEI Chapter and the Bay Area FENG. Then there is Accounting Web editor, Gail Perry and her experience as she writes in, Flying around CPA Island with Tom Hood. "After a few initial missteps, it became easy to move around. Avatars can stand up, sit down, walk, and even fly. At CPA Island we strolled through training and presentation facilities, trade show floors, kiosks, a media center, office space, and even break rooms (where my avatar stopped for a quick Red Bull). At various places throughout the island, we saw places where we could access PowerPoint presentations and direct links to schools and accounting firms. Several accounting firms and universities already have a permanent presence on CPA Island, as does Financial Executives International. The 3-D effect makes you feel like you're really in these rooms, whether it's sitting in the audience, speaking at the podium, or touring the booths." 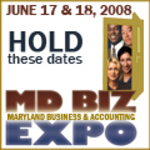 Visit our virtual trade show and sessions during the second annual MDBIZEXPO on June 16th & 17th. Look for us at the AICPA Tech Confence on Monday June 15th at the lunch keynote session, CPAs and the Virtual World of Second Life for details see the brochure Download 09_TECH_2r. Well what do you think is Second Life for real? Are CPAs really doing anything in Second Life? Isn't this just a passing fad? CPAs in Second Life, Social Media (Web 2.0), and the impact of technology on training (CPE) were the major part of the agenda at the Northeast CPE Directors Conference on Feb 8-10. The audience was captivated as we brought two accounting educators to the conference from within the virtual world of Second Life. Dr. Mike Kraten from Suffolk University in Boston and Dr. Steve Hornikfrom University of Central Florida both presented how they are using Second Life for accounting education. Social Media is here to stay and we all need to embrace it or be passed by. That was the message from Dr. Moira Gunn of NPR's Technation as she delivered the dinner keynote at the PearsonPHASE conference for accounting educators. She talkd a lot about the power of collaboration from tools like wikis (and I would add Second Life). FASB holds research meetings in Second Life! That's right and they had a decent attendance (15+) at their meeting last week as yours truly, Rocky Maddaloni popped in to see what was going on. 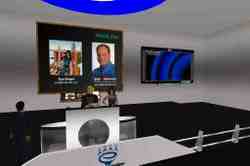 See details at the Metanomics website and thanks to Dr. Robert Bloomfieldaka Beyers Sellers in SL. See Edith Orenstein's post over at the FEI Blog, titled Get a (Second) Life. Dr. Steve Hornik did a demo for accounting educators at the Pearson PHASE conferences in Savannah, GA and San Diego, CA. He showed his virtual classroom, 3-d models used for homework by his students and talked about how he teaches 900+ accounting students per semester using Second Life to enhance their educational experience. Then I ran into my old pal (from Second LIfe), Jol Maximus. Jol is a French CPA who recently bought an island (in SL) and is developing interactive exhibits to sue for his small business clients. He said the reason he is working in SL is that the 3-D environment works well for showing accounting concepts to small businesses, it is where thought leaders hang out, and gives him great press & public relations. Jol is a local practitioner in France (two person firm). Don't miss our upcoming CPE Sessions from Second Life, like today's session by Ron Baker (of Verasage) titled, Leading Knowledge Workers - Human Capital, Not Cattle. You will see Ron present from within Second Life from his offices in California to a packed house at our BLI Conference Center on CPA Island. We could never bring in this type of training this easily to our members. So, what do you think? Is Second Life for REAL? A recent post by the Second Life Education in New Zealand covered a recent report from the University of Florida about training in Second Life. I found this thanks to a Twitter post by GiannaBorgnine. The study found that 93% of college instructors using Second Life in classes were satisfied enough to do it again and felt it enhanced the learning experience. "Post-secondary school instructors who conduct classes fully in Second Life are significantly more satisfied than those who use Second Life as only a small supplement to a real-world classes, according to an international research project from the University of Florida, reported in the Winter 2009 edition of the International Journal of Humanities and Social Sciences." And don't miss the exciting opportunities to get Continuing Professional Education in Second LIfe - visit our blog at www.cpaisland.comto register, view archives, and see upcoming events. Look me up iin SL - Rocky Maddaloni. If you know of other accounting educators or want a kiosk for your college or university, post your comments below and we will contact you. 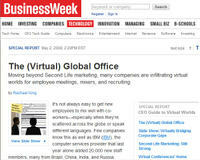 Still unsure about Second Life -- the virtual world -- as a tool for helping your business do better? Besides virtual meetings, the platform is also conducive to training. FastCompany Magazine makes the point in their latest article, The Second LIfe of Second Life and their earlier piece, Why You Should Have Your Next Meeting in Second Life where they interview Second Life creator Phillip Rosedale. IN addition to FastCompany Magazine, the Association community, Chief Learning Officer Magazine, and even the Journal of Accountancy think so. The latest feature story in Associations Now magazine titled, Meetings Remix: Time to Rethink the Ususal Format by Jeffrey Waddle mentions our efforts in Second Life to do real traininhg using the benefits of this exciting virtual world and social networking features. "Second Life may have started out as a playground for techies, but it has become a well-known virtual world where people play, do business and learn. As a result, more organizations are making the transition to virtual and ultimately finding an engaging, cost-effective training platform." Alexandra DeFelice, Associate Editor of Accounting Technology Magazine described it as, "leap(ing) into the next generation" in an article titled, Tom Hood - Virtual CPA in their August edition. Ryan Sharrow covered our two (2) "mixed reality" events at the Maryland Business & Accounting Expo in his article, Second Life Opens Virtual CPA Worlds in the July 4, 2008 edition of the Baltimore Business Journal. 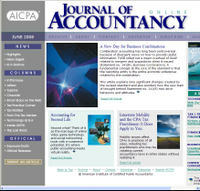 This is in addition to the Journal of Accountancy feature article in June, 2008, titled, Accounting for Second Life. Turns out we were the "buzz" at the AICPA Tech Conference this year mentioned by several speakers according to WebCPA editor Bill Carlino. Bill talked about the trend of "virtualization" and talked about our virtual CPA Island. He also said that virtualization is one of the technology trends that should be "in process" for CPAs and firms. I am very glad to see Second Life getting a fair shake in looking at the training potential of this fun and exciting medium. Check out the video of the session at this link. So what do you think, can you do "real" training in a virtual world? Today's post comes from Intuit's Small Business Labs blog where they picked up that we had started getting CPAs into Second Life with CPA Island and the Second Life Association of CPAs. They got it right, wherever there is an economy, CPAs are needed - Steve King termed it "following the money" in his post yesterday you can read here: CPAs in Second Life. That is exactly why our friends at KAWG&F became the first CPA firm in Second Life. In addition to the money, is the idea of following the next generation - the millennial or "gaming generation" who grew up in these games and are the impetus behind these "real economies" with their significant amounts of disposable income fueling the growth of this new form of entertainment. We think we need be ready to reach them where they hang out. So what are the reasons small business (and our small CPA firms who serve this important segment) should be in Second Life? We continue to think that Web 2.0 and virtual worlds will continue to be an important medium to interact and conduct "real" business in the future. What do you think - are these virtual worlds worth exploring are you sitting this one out? Attend the Maryland Business & Accounting Expo where we will feature several sessions on Web 2.0 tools for business and showcase a "live" mixed reality session from Second Life to the show floor, featuring Linden Lab (creators of Second Life), CFO, John Zdanowski who will talk about business in Second Life. if you can't attend live, you can join us in Second Life from CPA Island. By the way, Intuit is a premium sponsor of MDBIZEXPO and we will have copies of their report "The Future of Small Business" available for all attendees. CPAs needed in Second Life? Wherever there is an economy, CPAs will be needed. Considering that the virtual economy is one of the fastest growing economies around, there was a lot of interest in CPAs at yesterday's panel discussion with Beyers Sellers of Metanomics. You can watch the replay on SL TV by clicking here. Beyers Sellers is a RL (real life) accounting professor, Robert Bloomfield, PhD at Cornell University's Johnson School of Business and he teaches a class on virtual world economics and has started a very successful "virtual talk show" in Second Life. The show, Metanomics is broadcast weekly on the SL TV network. SL pathfinders, Arlene Ciroula (Chili Carson) and Byron Patrick (Bean Wollongong) of KAWG&F joined me (Rocky Maddaloni) on the panel focused on what CPAs are doing in Second Life and an interesting discussion on taxes in virtual worlds. We had to overcome some initial sound issues but overall the event went very well. One of the neat things about Second Life is the "back chat" that allows participants to "chat" during the show nd even have private conversations. The backchat was alive and well during this show and a lot of discussion and anxiety about the possibilities of taxing virtual cash. Another point Beyers made was that the lawyers are all over Second Life and the CPAs much less visible. The chart on the right is from our session with Linden CFO, John Zdanowski during the CFO Rising conference we also held virtually on CPA Island. 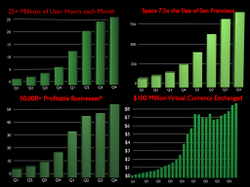 It shows the growing economy and usage of Second Life and its economy. With over 50,000 businesses and over $100 million trading hands, there isw no question it is real. John will be doing another session on June 18th as part of the Maryland Business & Accounting Expo at the Baltimore Convention Center. What do you think, why aren't more CPAs here? What do you think about taxing virtual transactions?